COMPLIANCE with CSQC1 for compliance sake does not add value to a firm. The purchase of a generic quality control manual with little integration into firm engagement performance is little more than a waste of administrative time. This issue is no different than the use of generic checklists to perform assurance engagements (see my blog post, "The new review engagement standard," for more). Value is derived from the tailoring and implementation of firm-specific policies and procedures. Not from a template approach that will generally result in the feeling that your time has been wasted, putting checkmarks beside the compliance tick-box. Instead, effective procedures are those that take into account the firm structure, staffing, type of clients and engagements performed, firm remuneration structure, and engagement performance tools. Lead by example, give a consistent message on the importance of quality control within the firm at all levels at all times. Insight: When a partner’s compensation is focused on billings and recoverability, rather than overall firm performance (which includes compliance considerations), quality control policies and procedures will be less effective. Insight: All staff in public practice need to be aware of the requirements in the CPA Code of Professional Conduct. Schedule short in-house sessions to review each requirement and discuss as part of your CPD program. For those provinces with ethics-based CPD requirements, you can meet two firm objectives. Accept only those engagements the firm is confident will be completed in compliance with all relevant standards. Insight: The extent of due diligence performed prior to client acceptance is your firm’s number one risk-management tool. Insight: Develop a tailored CPD program at a firm and individual staff member level, based on results of firm monitoring. Ensure each hour of CPD is providing the most value for the firm. Deliver quality assurance engagements in compliance with laws, regulations and standards, engage with consultants or other experts when you need too in the best interests of your clients, consider independent reviews prior to release to ensure compliance is met. Insight: Reconsider those engagements that are one-offs for the firm. If you golfed twice a year there would be no expectation that you would be good at it. Performing two audits a year is no different. Insight: Don’t wait for the three-year cycle to monitor firm engagement files. Monitor files continuously throughout the year. Ensure any deficiencies are corrected as soon as they are identified. Insight: Documentation of the firm’s policies (what the firm will do) is the starting point. Remember to also document the firms procedures (how the firm will do it). In and of themselves, the quality control requirements of CSQC 1 are nothing short of advice we would provide any client. 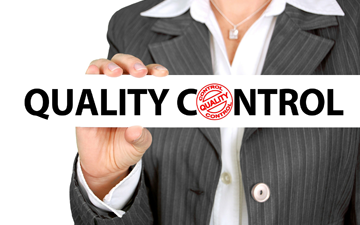 Quality control procedures can provide your firm with real value. But simply complying with CSQC 1 with a generic response is a waste of time and potential value. Take the time this summer to reconsider your firm’s quality control policies. Then design and implement the procedures necessary. You won’t regret it. Bridget Noonan, CPA, CA, is a partner at Clearline Consulting, which provides practitioners and their staff with the tools, training and advice they need to succeed and build thriving accounting firms. To receive our public practice newsletter and receive our guidance related to quality control visit our website or provide your contact information here. What does the new review engagement standard mean to your firm and clients? Like any good question in the accounting profession, the answer is "it depends"